This week we examine the venerable macaroni and cheese, a dish that started as a homey household staple, became the symbol of cheap, nonperishable convenience, and in the last decade, has been brought back by nostalgic fine-dining chefs and served at white-tablecloth restaurants. The good news for home cooks is that even if you make the mac and cheese that comes in a box, it can easily be elevated with creative additions. Here are a few tips from some of our favorite chefs, along with A.V. Club staffers. We take a jar of pimento peppers and blend them up, then put it in our cheese sauce. It gives the mac and cheese a kick, but it’s not spicy. And then we do toasted garlic breadcrumbs on top. We really like the crunchy top, but we don’t like the mushy noodles that it sometimes creates. So we’ll make the pimento cheese sauce, fold in the noodles, then top it with the garlic breadcrumbs to mimic the texture. Mac and cheese is a dish I cook at home with my kids. They love to be a part of cooking dinner, and this is a great dish to get the kids involved. First things first: Get good cheese. I usually always go for a sharp cheddar and a salty Parmesan. The kids love to help shred the cheese. I start by making a roux, which is butter and flour cooked together to make a paste. This serves as my thickening and binding agent for my cheese sauce—otherwise the cheese may separate, leading to a greasy mess. Add your milk to the paste and bring to a simmer. From here I have the kids slowly add the cheese. The trick here is to add slowly so your sauce stays velvety. Add your cheese until you get that ooey-gooey cheesy goodness. Season with salt and pepper, and for the finishing touch, I add sriracha hot sauce. It elevates the whole sauce! Lastly, if you can get it, try fresh pasta. I’m really big into doing a bacon-breadcrumb mix on top. You chop up some bacon finely, render it in a skillet, take it out of the pan, and add breadcrumbs. I suggest making your own breadcrumbs from day-old bread, but a good store-bought breadcrumb or panko will work, too. I’ll toss the breadcrumbs right into the bacon fat, and throw in some aromatics like garlic, parsley, or whatever herbs I have around to pick up all those flavors. You want to toast the breadcrumbs until they get golden brown. Then I’ll add the bacon back in, and you sprinkle all this on top of your mac and cheese and bake to finish. 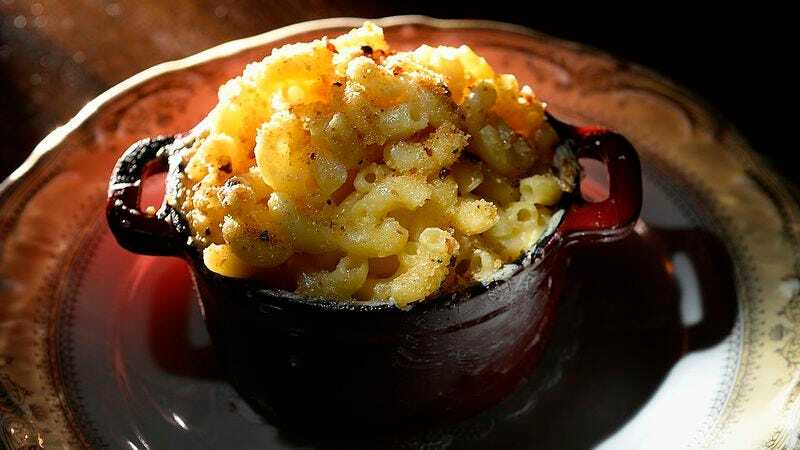 There are many different shades of mac and cheese: the elegant one done with several white cheeses and a Parmesan breadcrumb topping or the more rock ’n’ roll ones done with melty yellow cheeses and lots of butter. At Table & Main, we do the messy yellow cheese one. Our secret cheese is Velveeta—it has been shunned among many fine diners, but you really can’t beat the rich velvety melt it creates. To give our mac a tang, we add yellow mustard and lemon pepper and, of course, lots of butter. Being in New England, we use a lot of seafood. Lobster mac and cheese has become very popular at the restaurant. I do a bit of lobster bisque with the mac and cheese. I steam the lobster, use the claws and carcass to make the soup. Then I take the meat, mix with pasta, put the lobster bisque on top, and gratin with a bit of Parmesan cheese. I change the menu at my restaurant often, but this dish I have all the time. If you don’t have lobster, crab is a good idea. Clams work really well, too. I would sauté the clams with shallots, carrots, and mushrooms, deglaze with sherry, then add a bit of cream. Then I put that and noodles in the dish, put cheese on top, and gratin it. The most important thing about macaroni and cheese is to make sure the Mornay sauce is loose. It doesn’t matter what type of cheese it is. During the baking process, if the cheese sauce is too thick, the noodles will dry, resulting in a thick clump of pasta, which we all have experienced. If the cheese sauce is loose, the baking process will result in a creamy, custardlike pasta dish. The easiest way to keep the Mornay sauce loose is to allow the Mornay to cool completely and then fold into the pasta. If the Mornay is too thick, it will set up very firm when cold. You want to be able to run a spoon through the cheese sauce and leave a soft ribbon in the sauce. What I’ve learned since becoming a father is it isn’t always about how the food tastes, but how palatable it appears. We eat with our eyes first, always. So rather than slicing coins of hot dog into our mac and cheese, I turn it into a hot dog octopus. And the boy scarfs it down like it was the last sausage left on Earth. Like Johnny and Kevin describe, mac and cheese has become a staple in our house since the kids arrived. To liven up our dinner table, I turned to two TV chefs. Rachael Ray won me over with her butternut squash mac and cheese, which adds a subtle richness to the dish, while sneaking in some vegetables. (Though we use fresh squash rather than frozen, which makes the prep take a little longer than Ray’s signature 30 minutes.) For more elaborate occasions like Thanksgiving, I go all-out on Emeril’s four-cheese mac and cheese, which includes a béchamel sauce, cheeses like fontina and asiago, and of course, homemade breadcrumbs. Because it’s baked, it’s not quite as creamy as the stove-top version, but the elaborate process—which includes chunks of garlic, lots of herbs, and all those cheeses—still makes it a winner. Truth be told, even with all that effort, the kids probably still prefer the blue box over everything. I can’t even look at it anymore.